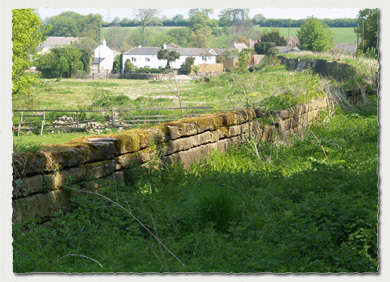 The railway which operated between Garforth and Aberford, was a private line for the purpose of delivering coal to a more advantageous point for further on going horse drawn carriage into the areas to the north around Tadcaster. The entire subject is covered in great detail in a book published by David & Charles authored by the local historian Graham Hudson. Although now out of print copies can be found from time to time on eBay and through Antiquarian book shops. 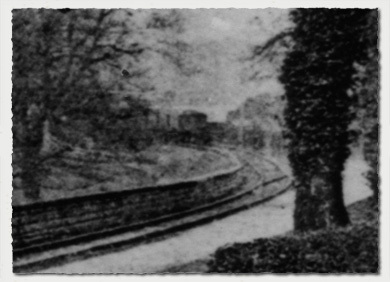 The railway closed in March 1924 some 87 years after the initial horse drawn affair was constructed. The line had been steam powered from 1870 and as the image at the head of this page shows the last train to ply the line was the MW Empress purchased in 1899 and purportedly called Empress to honour Queen Victoria's Diamond Jubilee of 1897. 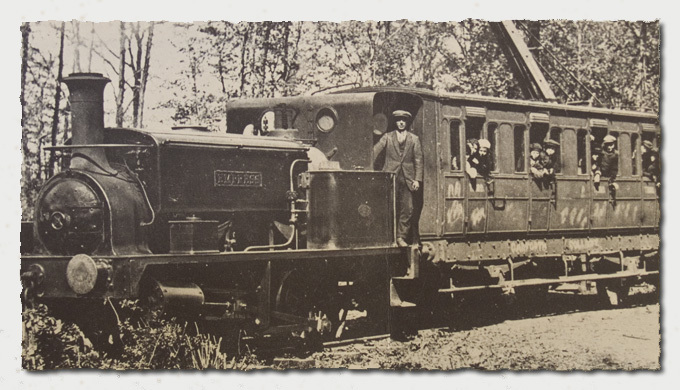 Although the main purpose of the line was for coal transport it was used extensively for passenger travel from the early horse drawn days through to the era of steam power. 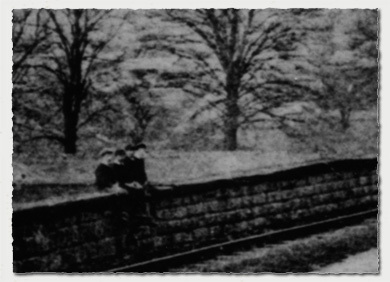 The casual approach of railway usage is amply demonstrated in this close up of four boys sitting on the retaining wall adjacent to the line in the image above. The second close up shows in the distance the train coal wagons and possibly the carriage at the Aberford Terminus, a few hundred yards beyond the Lodge on Parlington Lane. The recent shot is taken by the spot at which the boys were sitting in the old photograph, the retaining wall curves round to the location of the old coal staithes and the former coal depot [The white painted house]. 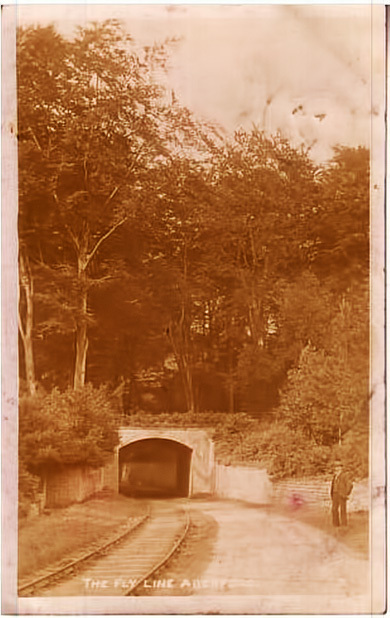 The railway boasted a number of bridges and structures to span over the line, but the one structure believed by many to be a railway tunnel; named the Dark Arch was never built for or used by the railway. However at the following locations there were simple footbridges to cross over the line. 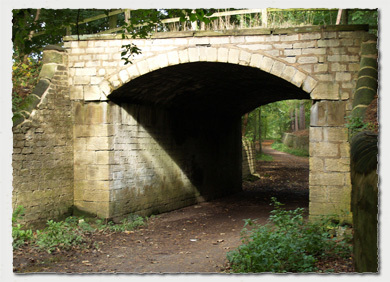 Starting at the northern end [Aberford] a bridge existed where the style is sited today some two or three hundred yards before reaching the Light Arch; which did have the train passing through it! Albeit the arch had to be removed and re-built to accommodate the increased height required by the train. Very few pictures exist of the railway, well very few have surfaced so far, given the existance of the line for the best part of ninety years. From the earliest beginnings of photography, and the rapidly expanding industrialisation of the coal mines and other industries, you might have hoped for more pictures of the line. Therefore when the photograph below surfaced on eBay I was keen to obtain the postcard, sadly as has happened on a number of recent auctions I was outbid; £13.41 on the hammer! Well I did get a preview picture, and with some work in Photoshop, it looks reasonable; okay, it looks acceptable! The view is looking east towards the Light arch, the same elevation as in the modern picture above. 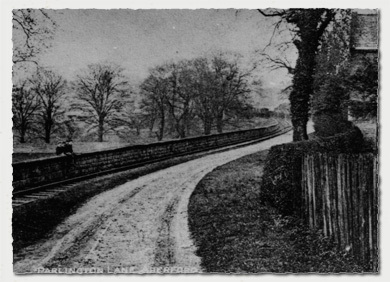 This view shows how the railway and roadway merged under the bridge, before the railway line curved to the left of Parlington Lane after the Light Arch. From that point onwards to Aberford the railway line was at the foot of the embankment on the north side of the roadway, until the two came close together again near the lodge house before reaching the terminus at Aberford.